Who doesn’t love fall? The trees go ablaze with color, the air takes on that indescribable crispness, and the latest Dangerous Goods regulatory publications become available. IATA Dangerous Goods Regulations (DGR), 60th Edition. THE industry standard for shipping dangerous goods by air, recognized by airlines worldwide. Who needs it: Any business that ships any kind of Dangerous Goods by air, from anywhere in the world to anywhere else in the world. Many small e-commerce companies don’t even know they’re shipping hazmat. If you’re in that category, please add this book to your shelves. 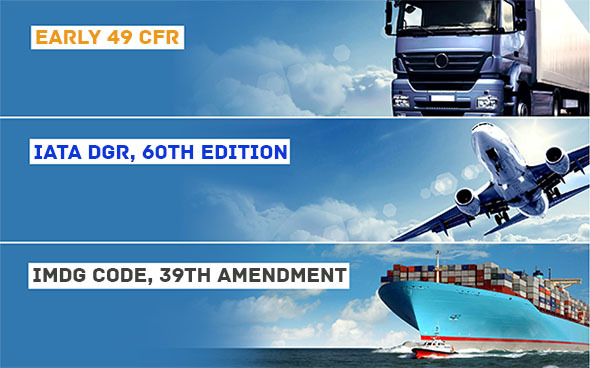 What’s new for 2019: Lots, including classification changes to Dangerous Goods carried by passengers and crew and several new or updated Special Provisions. When it’s available: Perfect bound in stock and ready to ship, spiral bound in early next week. Order yours today. IMDG Code, 39th Amendment. The required regulations and instructions for shipping Dangerous Goods by vessel. Who needs it: Any business that ships any kind of Dangerous Goods by vessel—typically meaning ocean-going container ships, but also including traffic on inland waterways. What’s new for 2019: There are numerous updates, but the highlight is a new, six-page redraft of the rules for transporting polymerizing substances. When it’s available: Now. Order yours today. Early 49 CFR. This Labelmaster exclusive helps you stay compliant with new rules adopted between the government’s annual CFR printings. The early CFR doesn’t just give you the latest changes; it features a UN 4-digit cross-reference table and an easy-to-read Hazardous Materials Table you won’t find anywhere else (except in our MasterRegs publication—see the next item). Who needs it: Any business that ships any kind of Dangerous Goods in the United States, whether originating here or elsewhere. What’s new for 2019: Only every change to every regulation enacted by PHMSA over the last couple of years, including significant harmonization with international requirements. When it’s available: November 2018. Pre-order yours today. MasterRegs™ 49 CFR. Another Labelmaster exclusive—a reader-friendly version of the U.S. DOT’s 49 CFR Parts 100-185 that includes easy-to-read Hazardous Materials Table, samples of compliance shipping papers and much more. Who needs it: MasterRegs is the perfect publication for businesses don’t have a team of hazmat pros who know the 49 CFR inside and out. This convenient, inexpensive guide saves you time with every shipment. What’s new for 2019: The same updates as in our Early 49 CFR. When it’s available: December 2018. Pre-order yours today. “The ADR”: Technically titled “European Agreement Concerning the International Carriage of Dangerous Goods by Road,” this important manual is due for a new edition in 2019, but details haven’t been released yet. UN Model Regulations. While these regulations aren’t legally binding on individual countries, they make up the basis for most international agreements on hazmat transport. An indispensable resource. Emergency Response Guidebook: Every vehicle transporting hazardous materials needs a copy of the “ERG” to help emergency responders quickly and accurately assess a hazmat incident. Questions about which publications your operation needs most? Call us at 800.621.5808 or contact Labelmaster online.